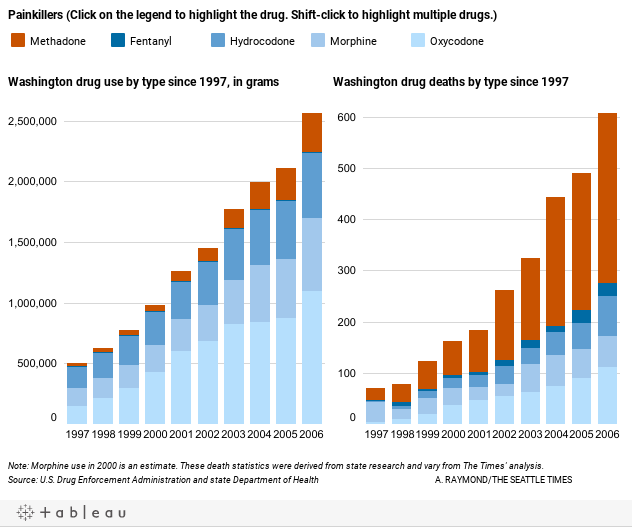 Scrutiny of hundreds of thousands of documents and customized databases left no doubt the decision by the state of Washington to use methadone as a narcotic pain killer was discriminatory and dangerous. Despite fierce opposition from officials, the paper was able to prove in a 10-month investigation that more than 2,000 people overdosed on the cheap but unpredictable drug the state was pushing to save money. Through exhaustive cross-referencing and shoe leather reporting, the paper showed that while 8 percent of poor adults were on Medicaid, they represented 48 percent of the methadone deaths. In swift reaction to the story, the state issued an emergency health advisory to more than 1,000 pharmacists and 17,000 licensed health care professionals, warning of methadone’s risk. For saving lives, IRE honors The Seattle Times and all the people who worked on that story. This is data journalism that made a difference in people’s lives. We’re happy that The Seattle Times team used Tableau Public as part of this story. Seeing the impact that data can have on people’s lives is motivational for our entire company. We want to congratulate The Seattle Times, our hometown newspaper, on this award and on their leadership in the field of data journalism. One of several visualizations from The Seattle Times' award-winning story. It's absolutely insane this wasn't stopped prior to the investigation . The state needs to be liable for those deaths, it makes my stomach sick to think the stare wouldn't react until it is exposed. Thank you Seattle Times, for putting people first, which is what we elect the state to do. I'm so sad for those who lost their lives, and the families impacted suffered at the hands of this policy . We need to stop the drug companies and doctors from even providing such dangerous prescription drugs to Americans . It's the number three killer in American. Start the war On prescription drugs. It's epedemic in this county.